To see how using colored pencils with a solvent differs from using them dry. compare these two similar quick sketches. Bet Borgeson planned to draw the lily on the left, using colored pencils as a dry medium. 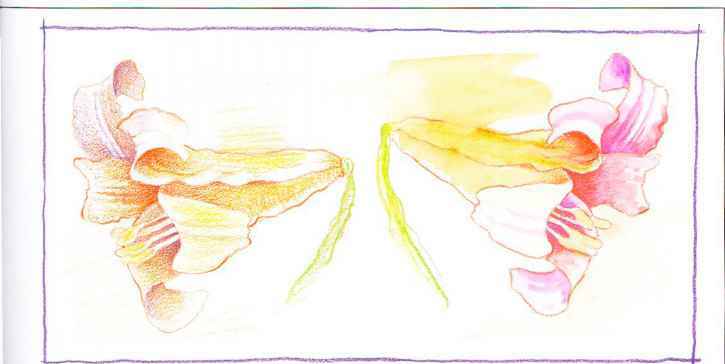 She planned to paint its twin-in-reverse on the right, using colored pencils as a wet medium. 1. 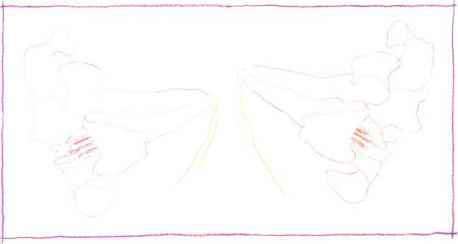 The beginning for both sketches was the same, despite the artist's plan to draw one and paint the other. She used a sheet of two-ply white Strathmore bristol for her paper surface. Colored and toned papers do not work well with colored pencils as a wet medium, since the solvent creates a dark trail that is confusing to work with. Because the painted lily was going to contain more than solvent accents, the artist used water soluble pencils for it rather than turpentine soluble pencils. She selected the Swiss-made Caran D Ache pencils—a good water-soluble brand. A Caran D'Ache red-orange #070 was used to very lightly block in both flowers on dry paper. A yellow-green #230 was used to define the stems. 2. The artist drew the lily on the lelt with four Prismacolor pencils and no solvent. The colors—931 purple. 923 scarlet lake. 918 orange, and 916 canary yellow—were applied in tonal layers for the flower, with some 913 green bice added for the stem. She handled the lily on the right a little differently Colored pencil was tonally applied where she wanted. But this was done rapidly and loosely. Much less pigment is needed when water is to be brushed into it. 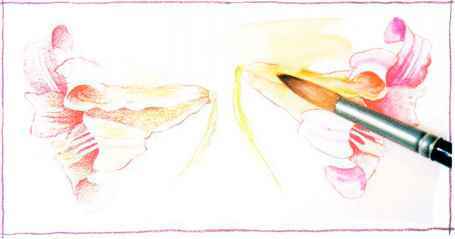 In the long horizontal body of the lily, for example, two Caran D'Ache pencil colors—a red-orange #070 and a yellow-orange #030—were applied for the darkest area under the curl of the petal. Then the artist used a #10 red sable round brush, dipped in water and lightly blotted on a cloth, to drag the color from right to left. After this was done, there was still enough wet color in the brush to break the linear boundary and push some color beyond the lily's contour edge. 3. A few minutes later, the paper was dry enough to draw back into some of the painted areas. (Had Prismacolor and turpentine been used, the wet surface could have been used or drawn back into immediately, without the few extra minutes of waiting—but the tones might have been a bit less smooth.) One advantage of this method over conventional watercolor becomes apparent at this stage: refinements of darkening a value or crisping an edge can be done with the tip of a pencil that is exactly the hue of a surrounding color. Comparing these two sketches shows some of the differences between colored pencils used dry and wet. But did you notice that the lily in the dry version needed a fourth pencil—a 916 canary yellow—to achieve an intensity similar to that accomplished with three pencils in the wet version? And not only does the use of a solvent usually increase color intensity, it increases speed. The wet version here took only half as long to do as the dry. 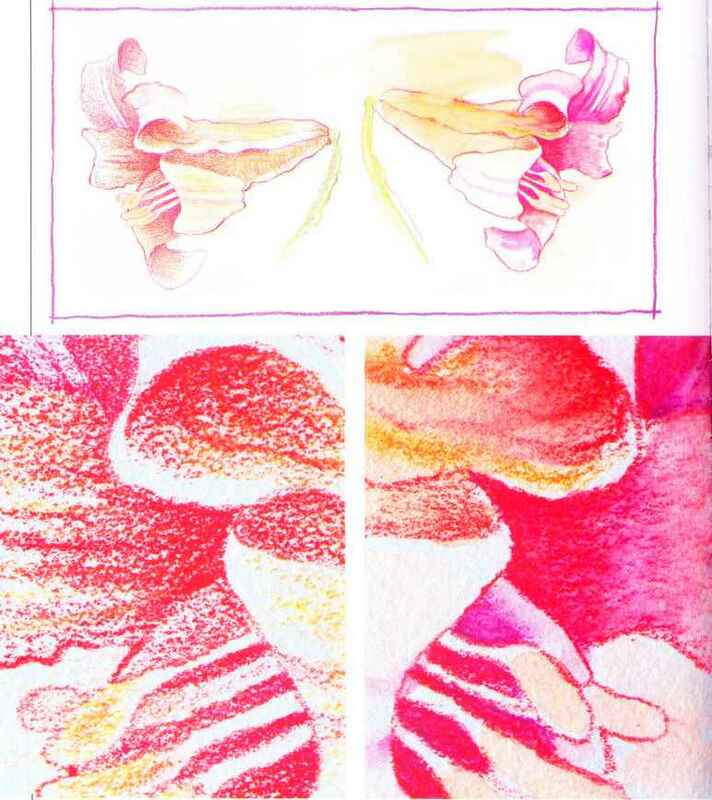 A close-up of the lily on the left shows the characteristic The same area of the other lily shows how colored pencil can granular look of colored pencils applied tonally, with no be applied dry over a previously washed area to refine or solvent used. modify a detail or value.